Hannes Egger has thought up a minimalist, interactive installation which contrives to place the public centre-stage. 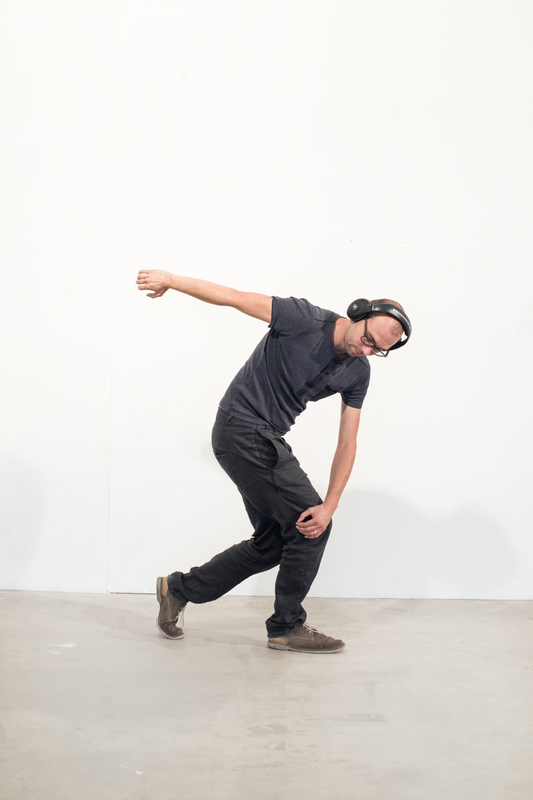 Visitors are invited to a Training Exhibition where they play their own part as the artist dictates his instructions through headphones. In sequence the speaker describes five artworks that made sculptural history, inviting the listener to move or pose so as to achieve a resemblance. The idea is to get the public to home in on the artwork from an alternative angle involving the sense of hearing but also proprioception and prossemics. Visitors appreciate a 3-D art object by themselves becoming sculptures, at the same time as being on show before others taking part or any visitors who happen along to the open-space showroom. The headphones serve both to bring together and to exclude. They are a link among those taking an active part, but block out those not wearing them whose curiosity is, of course, aroused: why are the headphone-wearers acting that way, and what object are they hearing about? The interpreters on stage join a kind of art-induced community, whilst acting essentially on their own and not with one another. A shared and tutored solitude much like one gets in a gym or at evening classes, but also an experience of art history and a way of proving oneself, testing oneself, spurring one’s imagination. Though all receive the same instructions, they each react differently, expressing singularity amid togetherness. The project aims to remove the visual altogether, leaving room for participatory performance which becomes a living art exhibition.